There's some striking imagery in the new trailer for Infinity War. While Marvel fans are extremely excited to feast their eyes on the new footage, it has been promised that there will be bloodshed and loss by the Russo Brothers. The trailer features some pretty tense situations for some of the most beloved superheroes in history, including Thor, Captain America, and Iron Man, all three of which are seen in separate scenes with the villainous Thanos that point to grim endings. However, it's another character that may be in an even worse predicament than the others, especially when compared to the Infinity comics. The new Infinity War trailer gives us our best look at Thanos' Black Order that we've seen thus far, which is great, but not so good for Benedict Cumberbatch's Doctor Strange, who is seen being tortured by the group's Ebony Maw. 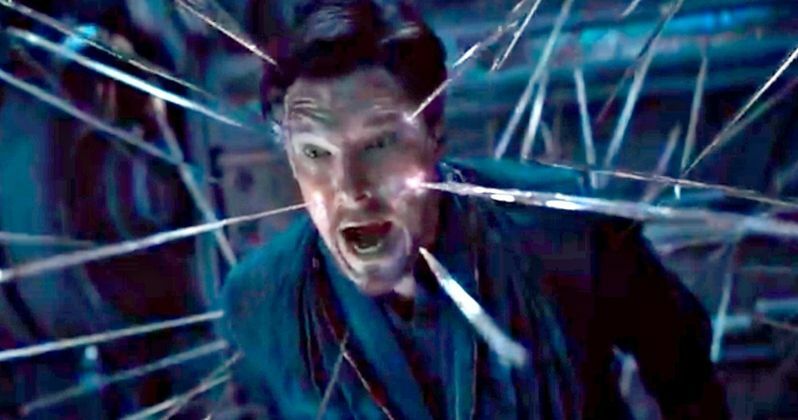 The character is seen with spikes going through his body, screaming in pain while Ebony Maw looks on and smiles, bringing his finger to his mouth to silence Strange. This silence could be a way of just shutting Doctor Strange up, or it could be something far worse. The imagery is striking and hard to look at. But, when paired with some knowledge from Jonathan Hickman's 2013 Infinity event, which is one of the larger pieces of source material for Infinity War, it's a lot harder to look at. In the comic, Ebony Maw is able to torture Doctor Strange under orders from Thanos because he knows the location of the Infinity Stones. Maw is able to extract the information and uses Strange as a double agent working for the Black Order to show Thanos exactly where all of the Infinity Stones are. It was revealed in the Infinity War prequel comics that Doctor Strange knows the location of the Infinity Stones, making him a prime target for Thanos. If this storyline is followed, it won't be a very good situation for the Avengers. And by the look of things, nothing is going very well for anybody in the new trailer. Captain America is shown in battle with Thanos while he has two Infinity Stones and Tony Stark is seen in some busted up armor as Thanos gets ready to pounce from above. This is speculation at this time, but the Infinity War trailer seems to be taking from the Infinity comic in terms of the Doctor Strange story arc. At the very least, he'll be tortured for his knowledge, but will he become a double agent? We'll just have to wait until April 27th to find out. One thing is abundantly clear and that's just how powerful Thanos and his Black Order really are. For now, you can check out the brand-new trailer for Infinity War and decide for yourself about the fate of Doctor Strange below, thanks to the Marvel Studios YouTube channel.